Since Tony Benn left parliament in 2001 his political persona has been that of a genial firebrand of the left. This candle, currently in the collection of the People’s History Museum, represents that face. Benn holds his famous diary and smokes his homely pipe. The cuddly political stalwart was but one career of Anthony Wedgwood Benn. Documents here at the People’s History Museum show the trajectory of a man who began as a progressive within the Labour movement to someone who was a standard bearer for the hard left. Benn had been a BBC producer before being elected to parliament at the age of 25 in 1950 for Bristol South East. Labour put the young radio executive’s talents to good use as he set about reforming the party’s communication. In the collections here at PHM we have a poster designed by Benn. Produced in 1955, a time when few people had televisions, Benn’s intention was for those with, to invite those without, to watch Labour’s election broadcast on their set. In the Wilson government Benn’s image as a man of the modern showed through. Whilst working as Post Master General, he saw the opening of, the Post Office (now BT) Tower. A familiar site to Londoners, it was, a beacon of modernity when first built. 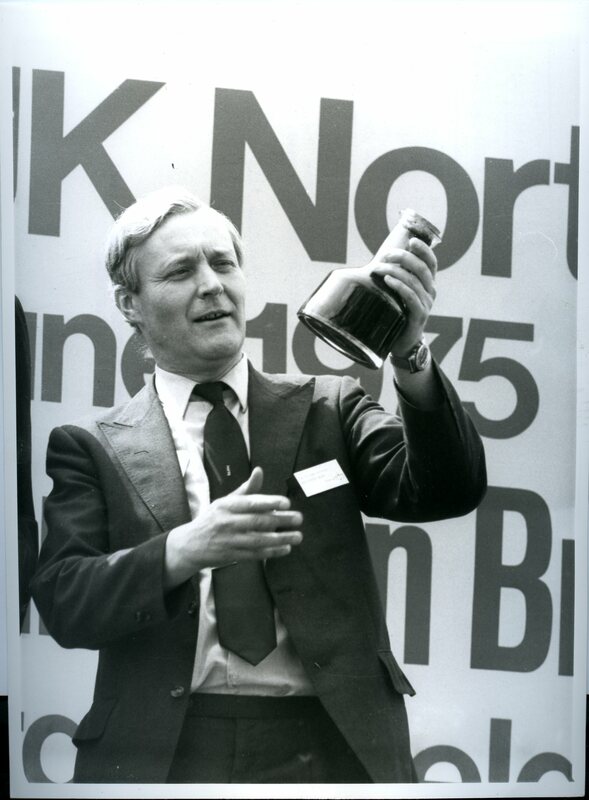 During his period as Minister of Technology he played a part in the development of Concorde and when he returned to the cabinet following the Labour victory of 1974, first as Minister of Industry and then Minister of Energy, he was partly responsible for the commercialisation of the North Sea Oil field. He kept a bottle of the first North Sea Oil for the rest of his life. Given this cabinet career served largely under Harold Wilson, Benn might have been considered within that group of reformist politicians who had wanted to bring Labour closer to the centre. However, towards the end of the 1970s and 1980s, Benn moved dramatically to the left, claiming that this was because he was upset by the centralisation of power in the party structure. Benn became increasingly associated with the trade union movement, perhaps seeing it as a platform to launch his own attempt on the party’s leadership. He was a firebrand of the left during the 1980s. Hugely popular with activists and a great orator, Benn’s support for strong left wing policies was at odds with moderates in the party. In 1988 he ran for the leadership against Neil Kinnock, on a ticket with fellow socialist Eric Heffer. The divisions between the Bennite faction and the rest of the party still run deep. During a conference held last year at PHM to mark 50 years since Harold Wilson’s White Heat of Technology speech, the Wilsonite Gerald Kaufmann was decisive in his views that Benn should not be remembered as the cuddly elder statesman he became, but as the fiery figure who prevented unity in the 1980s. While politicians drift in and out of favour, Benn’s popularity remained until his death. He was a conviction politician and a great orator, both of which are perhaps lacking in today’s parliament. But for a man whose political life spanned the whole of the post war era, it’s important to remember that he had not one political career, but several. This entry was posted in People's History Museum, PHM Collection and tagged People's History Museum, Tony Benn. Bookmark the permalink.